FixThePhoto wedding photo editing is your 24/7 photo editing service, professional photo culling, stylish color correction wedding photos, beauty wedding photography edit, and natural portrait enhancement. Reasonable pricing, high-quality wedding photo edits, seasonal discounts and satisfied feedback are guaranteed. Do you need to edit hundreds wedding photos but the next wedding photoshoot is planned for tomorrow? Looking for a wedding photo edit service online with a quick turnaround and still guarantees top quality? A $2,000 DSLR camera and a good eye for photo composition cannot guarantee a perfect magazine wedding images, but there is stuff you cannot control like the unclear lighting in the church, and a bridesmaid’s rosy face after her fourth glass of champagne. Now it is the time to use online wedding photography post production services to raise your wedding pictures to pro levels. Fix The Photo editing service is ready to help you in a peak wedding season and realise your the most creative ideas by means of Photoshop and Lightroom. Professional group of talented wedding photo retouchers and digital artists with years of experience in event photography and wedding photo editing. Following your photographic style: wedding photo edit is made according to your preferences and instructions. Revisions are provided to receive only desirable results. FixThePhoto wedding photo editing - we retouch until you are fully satisfied. Wedding photo edit rate starts from $0,05 per photo. Image culling - from $0,05 per image, color correction – from 0,20 per image. Two wedding photo retouching packages to save your money on volume orders. Easy placing order and payment system. Friendly and 24/7 customer support that is ready to answer your questions about photo editing and registration. If you've got any questions or you want to submit the order please get in touch with us via e-mail fixthephotocom@gmail.com or our online assistant through the live chat which you can find in the bottom of this page. Cannot find time for wedding photo retouching? While your clients are already far way enjoying their honeymoon, you are overworked with new orders. You can trust this tiring responsibility to us and outsource Photoshop editing us. 30% of all wedding photographs are the images of a bride in her beautiful wedding dress. While editing wedding photos in Lightroom, mind the proper white balance setting, hues, saturation, temperature, and shadows adjustment. 13 years in wedding photo editing business, thousands of beautiful and glossy wedding photo editing before and after samples. Our photo retouchers always follow the last wedding photography trends, do advanced and complicated wedding photography edit in pastel, matte, film, vintage, sepia, black and white, and dark styles. Our main purpose is to make our customers photos special, unique, romantic and moody. Whether you took a lifestyle photo where the composition is highly off balance or a staged group family photo, all wedding photos need a little tweaking. 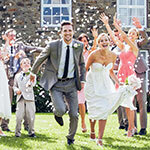 Cropping is the first step of in your wedding photo editing work. Noise distracts from the foreground, focus and overall effect of the photo? If your wedding photos look bad because of poor lighting, do not be upset, FixThePhoto wedding photo editing service provides professional skin retouching and guarantees natural and glamour skin color and texture. Acne, blemishes, zits, scars removal is possible here. Even perfectly edited skin will not look so appealing without a flawless white smile like all well-known Hollywood celebrities have. So, it is not a secret that teeth whitening is also a must have in any wedding photography edit. We promise you that your customers’ smiles will be without visible and artificial photo editing footprints. Nobody will suspect you in using wedding editing service. Wedding photographers are not always able to organize photo sessions in proper locations without strangers and unnecessary objects on the background. Order this wedding photo editing service and receive professionally edited backdrop for the reliable price. Walking strangers, unnecessary grass, spots, dirty, objects on your wedding photos are not a problem. By means of professional photo editing in Photoshop natural objects removal is possible. Brightness level is another vital option when editing your wedding images. Some close up portrait images indoors can be too dark, but a simple tweak of the brightness settings can be all it takes to magically enhance the photography scene. If your clients want creative and stylish color effects on their wedding photographs, trust FixThePhoto this photo editing task. Our group of experienced and highly motivated digital artists provides excellent wedding photo editing of exceptional quality for photographers from all countries and with any requirements. No matter what weather conditions were: wind, rain or snow, all photo retouching services are provided. Optimizing the levels of contrast is like adjusting brightness or exposure in your wedding images. If you want the perfect balance of highlights and shadows, address FixThePhoto, it makes photo retouching radically easy. Now you may forget about pulling sliders over each one of those photographs till you get cross-eyed. Every bride wants her wedding pictures look fabulous and glamour in the wedding album. Only professional wedding photography retouching in Photoshop helps achieve this result. Magazine wedding photography is real now even for amateur photographers or those who are not good in photo editing. When taking hundreds of images throughout a long wedding ceremony day, it is not surprising that you or your second wedding shooter will take some images out of focus. Especially if these are lifestyle images. For this drawback we use the sharpness tool and make skin look sharp and perfect. • Picture Culling Services – Only $0.05 per image. It is a really time-saving effective option. Our photo editors will sort through all your images to find exactly the best examples. Every step will be conducted under your guidelines and important wishes about picture quality criteria. • Color Correction Services – Only $0.20 per photo. Do not think that color improving is a simple task. It consists of saturation and exposure correcting, complete tonal range, vibrancy or light balancing. To match your personal photo style, we will work carefully with shadows or highlight compensation or improve black & white pictures. • High End Image Editing Services – From $10.00 per final image. In case of ordering this kind of wedding editing service, you will get superior body correction together with portrait retouching. Visible eyeglass glare, wrinkles masking, extending or removing backdrop, which is unsatisfying, weight reduction and deleting all spots from clothing are provided. The final photo after this wedding photo editing is definitely worth its rate. If you want to know a clear price on your wedding photo editing order, attach several photos here (all file formats are accepted). You may also add the sample images you want to receive as a result, mark out the areas you need to retouch, and write what exactly you want to change and what things not to touch. This is an easy and fast way to know the price without signing in, just having written your email and a name.